I need to have a work with you about three make up products that I’ve been having a but of an affair with recently – spoiler, they’re all blushers. With Valentine’s Day in less than two weeks (why does it always sneak up on me like that?) reds and pinks are out in force and it’s given me serious rosy cheeks vibes. I’ve been wearing brighter blush shades as spring rolls in (fingers crossed) and prepping myself for the bright pinks and dewy glows of summer. 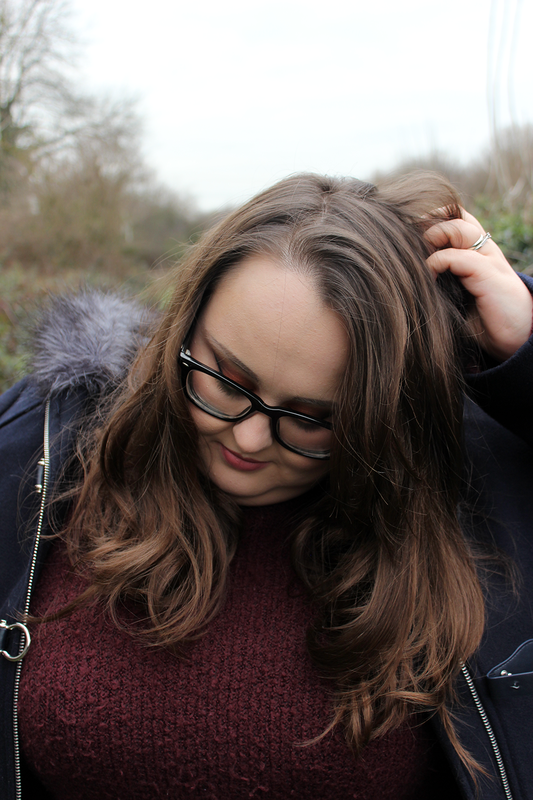 Even though I do love a cosy afternoon in with a warm drink, a candle burning and a good book on the go – the dark and dramatic make up looks of winter can wear on me after a time. 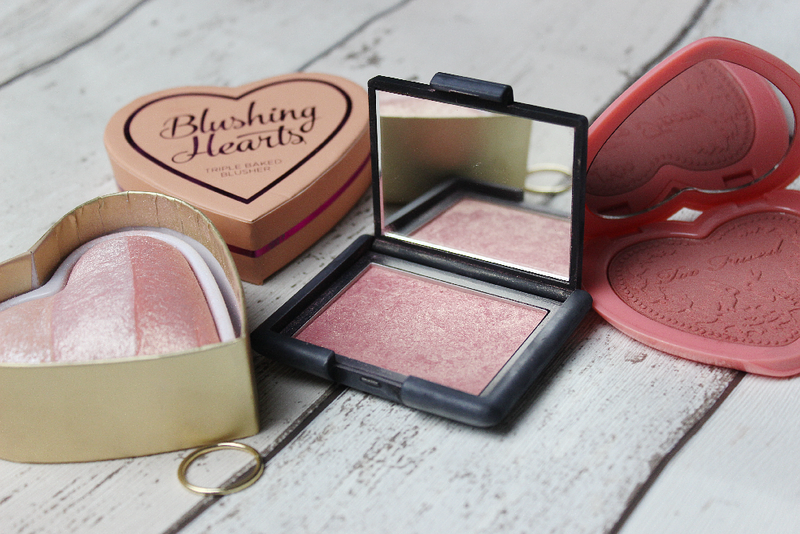 So, I’ve been living my best life on my cheeks instead these past few weeks and these are three of my current favourite blushers that I’ve been dipping into. I do believe that this is meant to be a blusher first and foremost but I use this so often as a multi-use product from cheek to eyebrow highlighter as well as a bush. 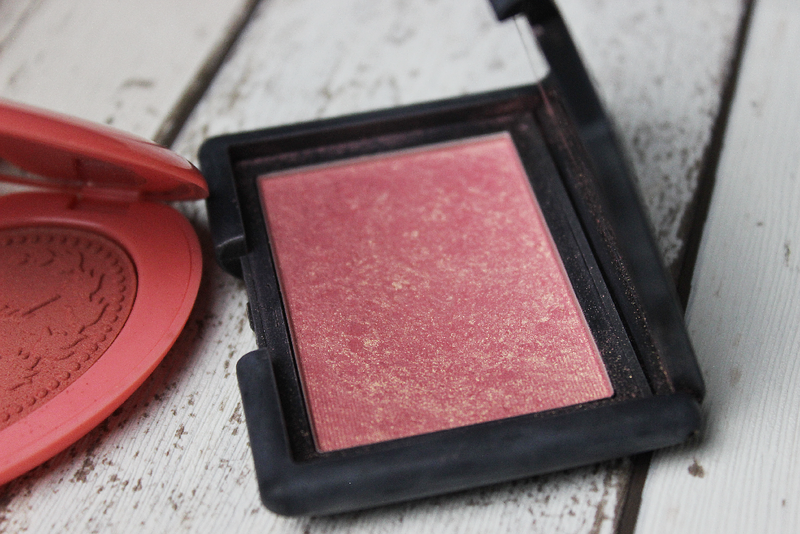 This baked blush is one of three I picked up with the Make Up Revolution/TAM Beauty offers in Superdrug. I find that every one of these perform on shine as well as colour. The glitter is minimal but the tones are strong af, these baked blushers and highlighters are a part of my make up stash staple these days. The reason I love to use this particular one so much is how subtle it can be on the cheeks. I find that if you build this using the upper left you get the shimmer and the bottom right the colour and the results are stunning. The velvet pink suits my undertones and often compliments whatever look I’m going for on any given day, and not to mention how affordable these are, winner. I mentioned this blusher before Christmas and although Santa didn’t leave me one under my tree on the 25th I still got my mitts on one. Almost every-time I pick this up to use I get distracted by the packaging. I know that it’s just cheap pink plastic but it’s so reminiscent of Polly Pocket and my inner 90s girly-girl. My first impression when unwrapping this for the first time was the print in the pan, oh my god it’s so pretty I didn’t want to use it and ruin the patterning in the product. Also, I noticed that when I did take the plunge and use it the first few times, a little goes an incredibly long way with this formula. The pigment is strong with this one ladies! The fall-out is thankfully minimal (unlike their eyeshadow palettes) but the colour can be blocky on the cheeks without a good blend – but there’s nothing wrong with that. The shade has been a little too dark for some days but then dramatic enough for others. This unfortunately isn’t a blusher for daily wear with my pale skin but I always feel the difference when I have it on, it’s just one of those make up products that makes me feel a little bit special that day. Just like wearing new underwear. I bought this blusher on high recommendations from the blogging community for my wedding day make up and now it’s a favourite that I reach for the most of the bunch. I would wear this every single day if I got round to it. You can tell from the photo that the packaging is a little smudged and dusty, I find that the material on NARS packaging is like a magnet to that dust you get in a make up bag that is always hanging out at the bottom from an old broken powder etc. It’s a massive pain in the bum – if you couldn’t tell already I like to look after my make up and keep it as shiny as possible throughout it’s life. 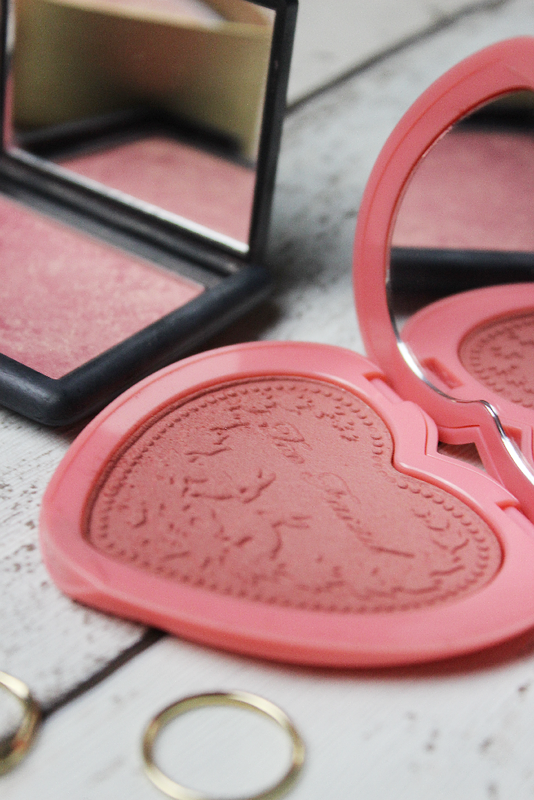 This blusher though… I have hardly any words to explain how much I love it. This is my number-one wear for every day. It’s so very subtle on the skin but strong enough to leave an impression that compliments the apples of my cheeks. I thought the colour was too weak to begin with but looking at the brighter shades from NARS IRL instead of on a website helps me to realise that I made the right choice with this one. I didn’t quite grasp until I was putting together this list of my top three exactly how much I go for this blusher and now I can’t stop thinking about how many days in a row I’ve probably worn it for. Comparing all three and if I had to choose only one of these to put in my dessert island make up bag I’d struggle, they all have their own strengths and reasons why I keep them so close by. I’m sure I could make room for the extra baggage though… we all need our little luxuries in life and I think right now mine has to be all the blush I can manage! 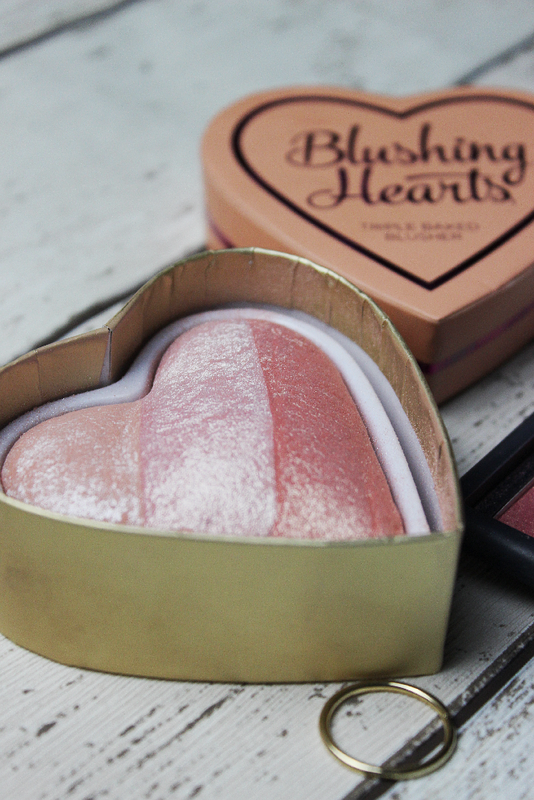 Have you tried any of the blushers in my list? What did you think of it? Let me know in the comments.